Well then. I finally got around to uploading the photos from our trip that now seems quite a long time ago. 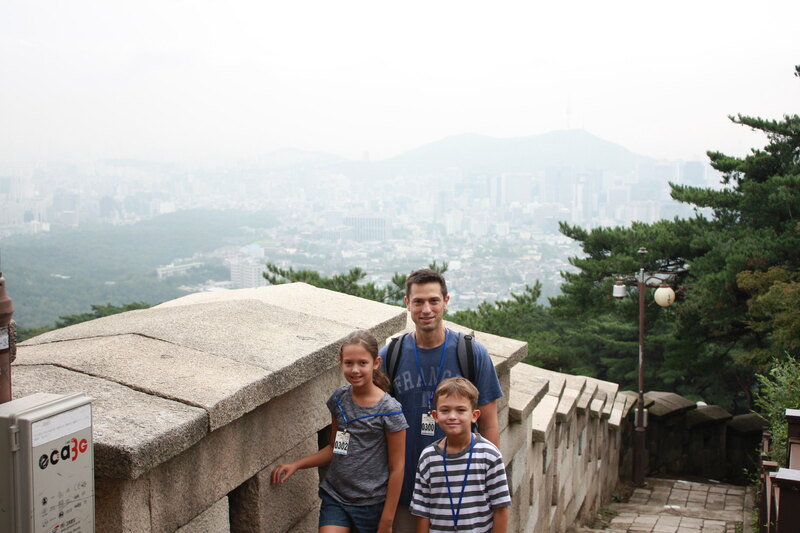 We started our vacation off in Seoul. There is a bus that runs from Osan Air Base to the Army base in Seoul. Traveling by bus is the best choice, as there are special bus lanes that bypass the always-terrible traffic that surrounds Seoul. It took about an hour and 15 minutes. 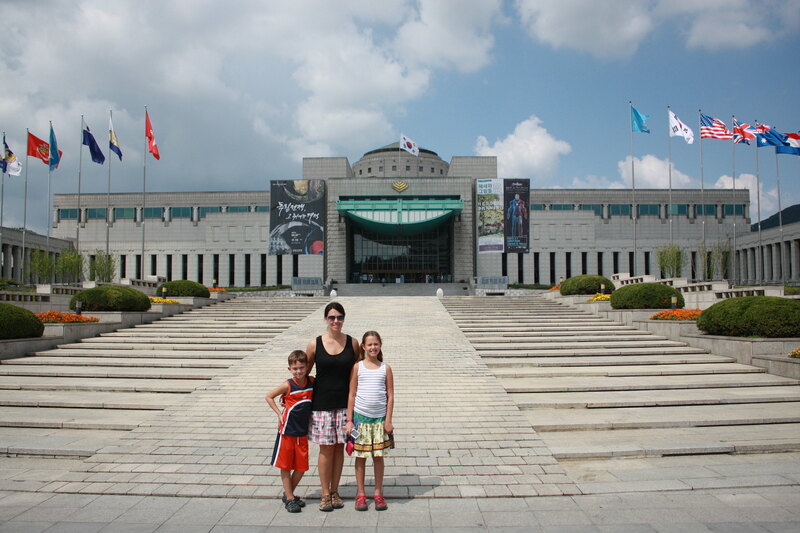 We visited the Korean War Memorial. It was a well done museum, but very large. 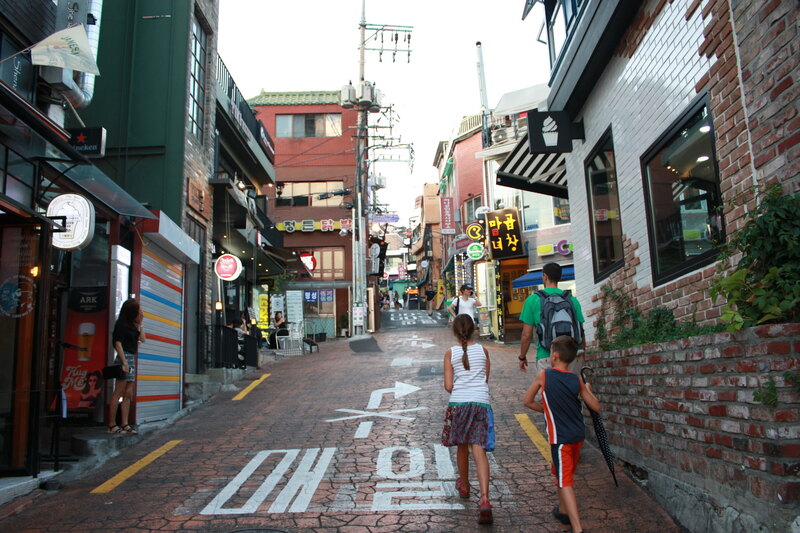 We ate a lot of meals in the Itaewon district of Seoul. It was walking distance from where we stayed, and has many international choices for dining. 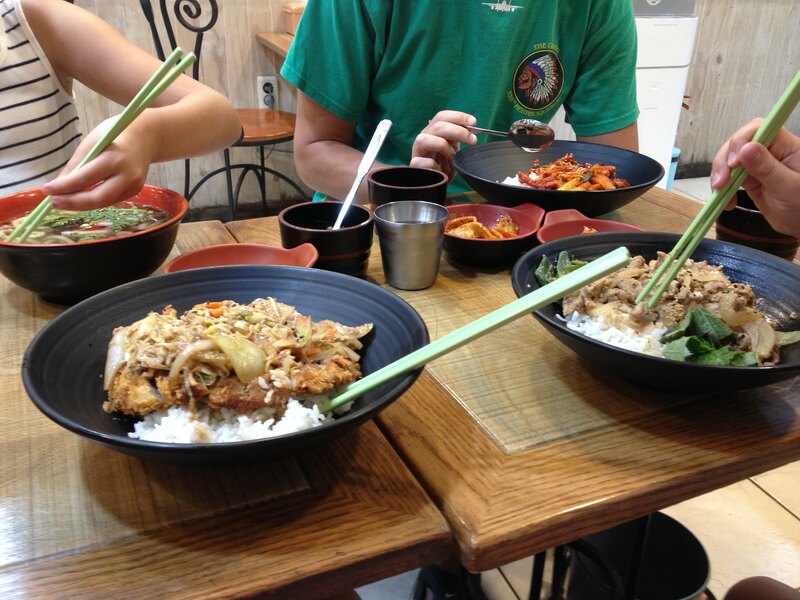 We don't particularly love Korean food, so it was nice to have options. 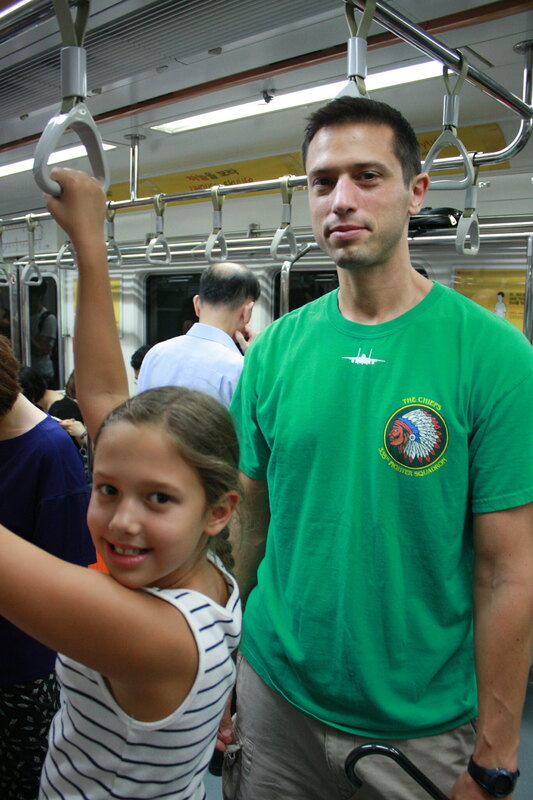 We got around Seoul by using the metro system. It's a nice system and inexpensive. My kids have now navigated the subway systems of Washington DC, Madrid, Paris, Barcelona, London, and Seoul. 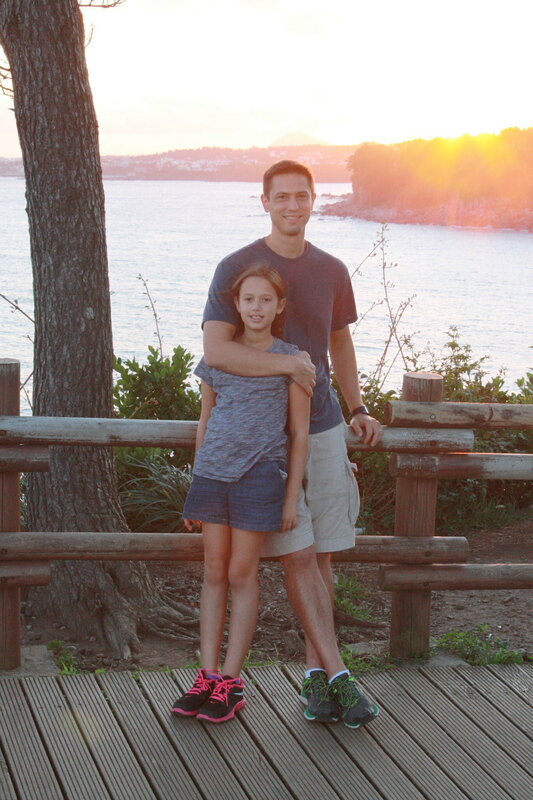 I sometimes wonder if their nomadic young lives will give them the travel bug as adults. 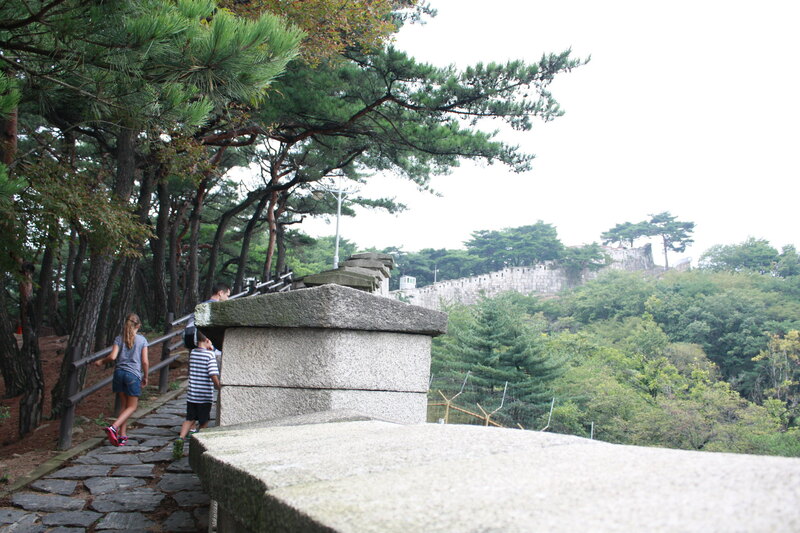 Josh's favorite part of sightseeing in Seoul was hiking the fortress wall that surrounds the city. We walked along the northern part that comes close to the Blue House-- the presidential house. There was a lot of security along the way, and eventually we got to a checkpoint where a security guard confiscated my camera and erased several photos that I had taken. Oops. I cannot adequately express how many stairs we climbed and how painful it was. My calf muscles were twitching. 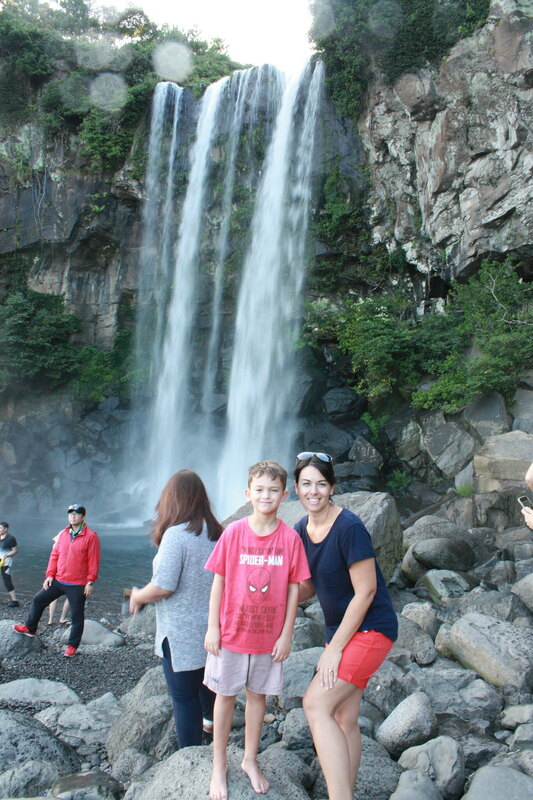 A few days later, we took the metro to the airport and boarded a flight to Jeju Island, off the southern tip of South Korea. It was gorgeous! 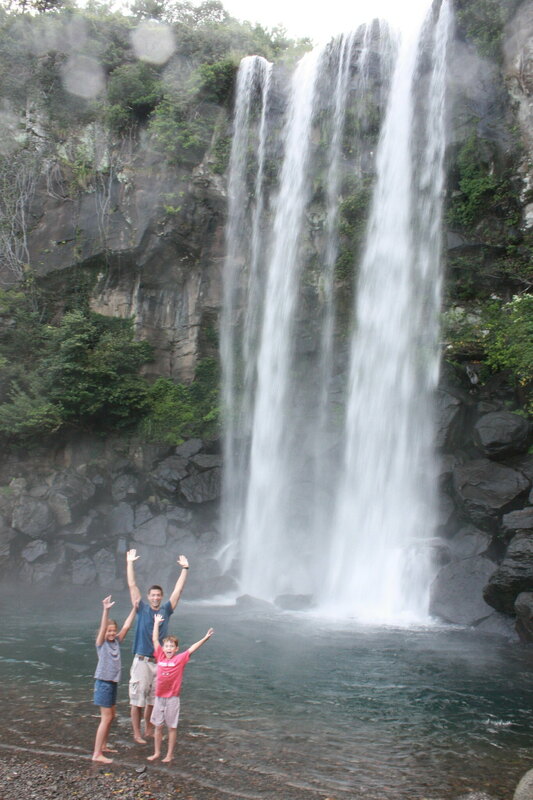 We saw lots of waterfalls. 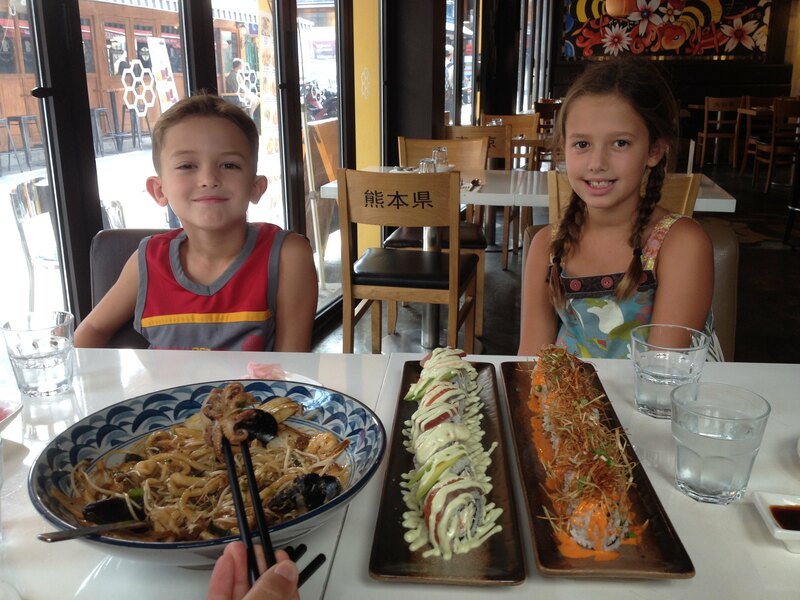 We found a Korean restaurant that everyone enjoyed, and ate there twice. I apparently loaded the photos out of order-- this is a Japanese restaurant in Seoul. Alex tried the octopus legs and like them! Back to Jeju. We appreciated the small amount of English on the sign. Josh was having chest pains just from thinking about swimming. 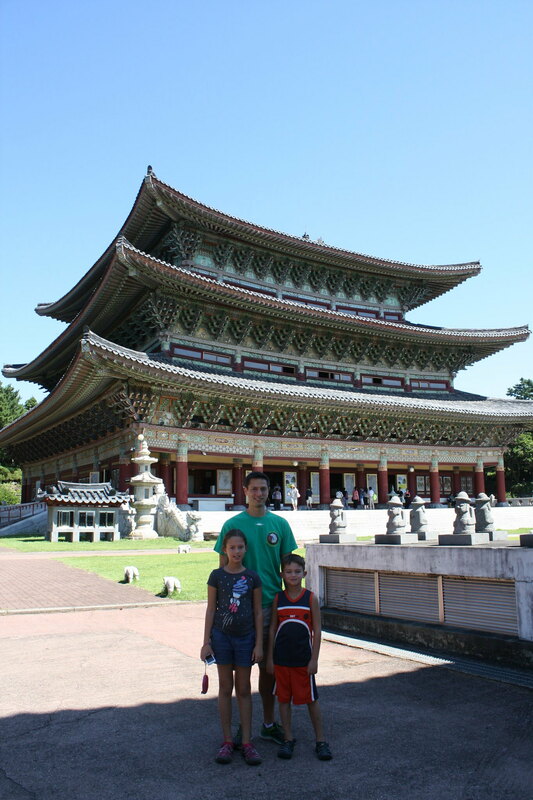 A Buddhist temple, and an impromptu lesson on world religions. 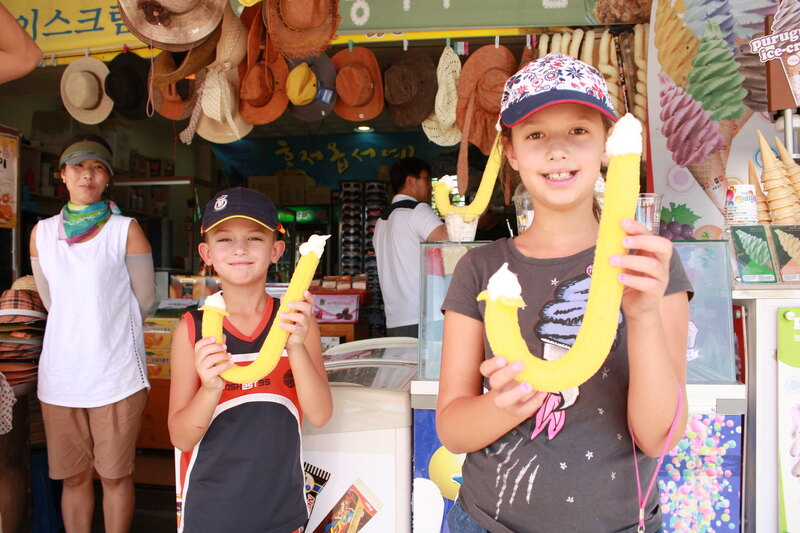 They had a special machine to fill these cones all the way through with ice cream. The beach is the native habitat of the Schore family. It is our happy place. 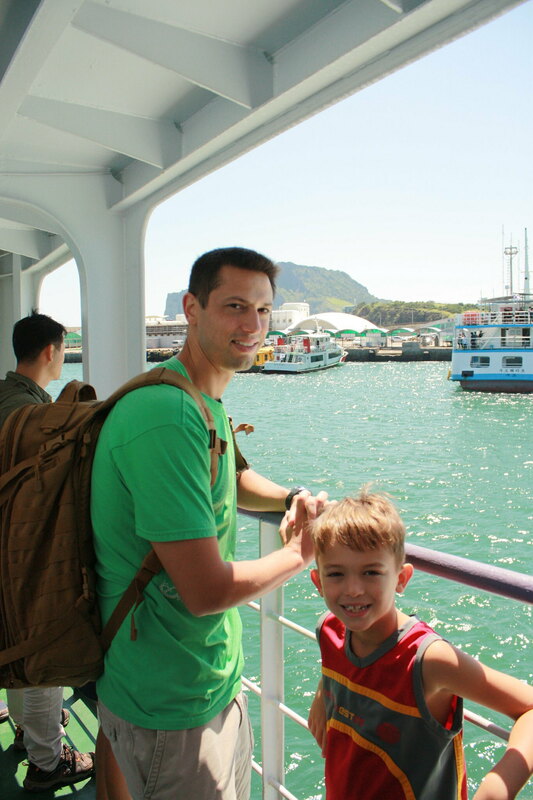 We enjoyed visiting tiny Udo Island, which you get to by ferry. This beach was our favorite spot of the whole trip. 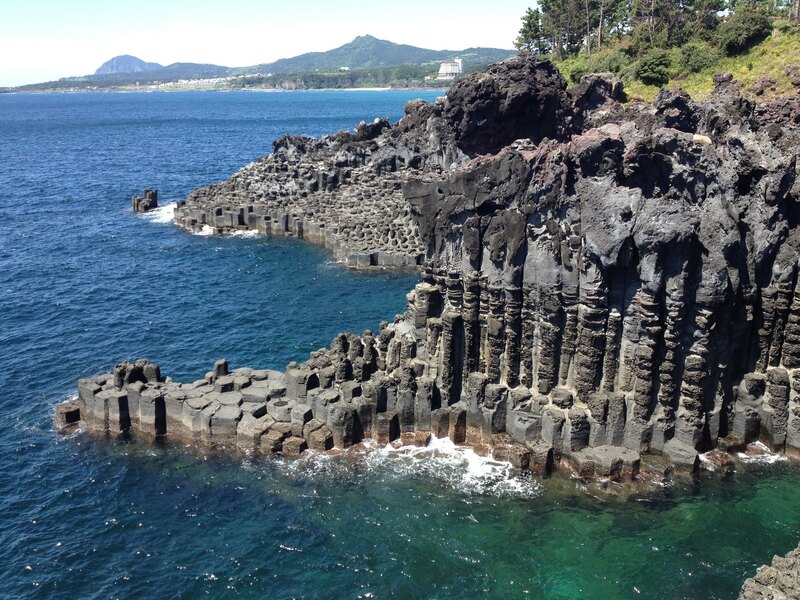 You can see the peaks of Jeju and the water was clear and fresh. 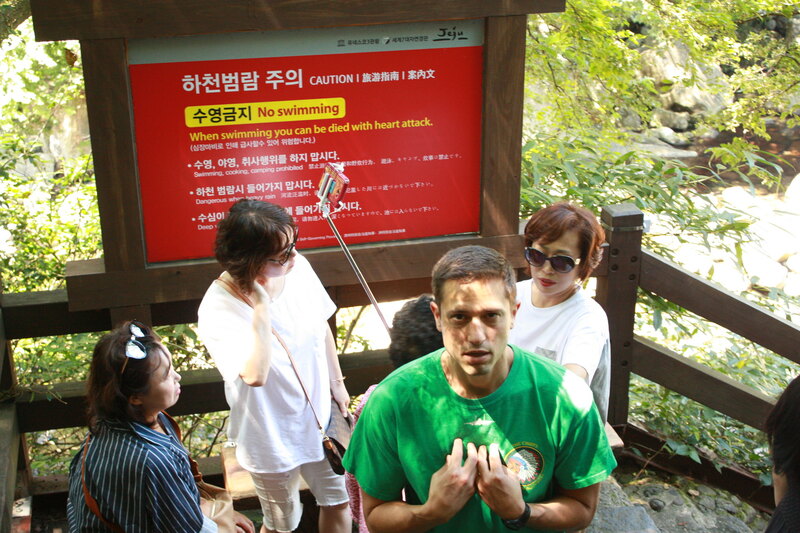 It was a nice little getaway, and good to see more of Korea than just our little city. I vaguely remember a blog post from last year in which I admitted that my weekdays basically consisted of recovering from the weekends, reading books on the couch, and drinking coffee. The worst part of my weeks was the required trips to the grocery store, which I made without children. There are certainly good things about our situation here, only they include precious little "alone time" for yours truly. Now the trips I make to the grocery store without children constitute almost the entirety of my alone time. I think we're finally all settled in and feeling like this is home now. I can navigate the apartment in the dark without running into the walls, I don't notice how hard the Korean bed is anymore, and I've mostly gotten the hang of backing into parking spaces (which is the only way it's done here). I'm not afraid of driving anymore-- even the infamous 'triangle of death' outside of the base's main gate doesn't give me pause. Who cares if traffic can go 6 different directions and no one has the right-of-way? The Corolla can hang with the best of 'em. So life feels more normal, although certainly a bit less convenient than in the States. Activities of daily living are very much a guessing game-- from my Korean washing machine to the strictly enforced recycling system, every day presents a new opportunity to screw something up. - When we get utility bills in the mail, we have no idea what they say. Electric, gas, water? Who knows? We have to take them to the property manager and he takes our cash and pays them. - People ask to take photos with us sometimes. Because I don't know why. - Bike helmets are not a thing here. Which is odd, because terrible driving is definitely a thing here. - We often feel deep disapproval coming from waitresses. We haven't figured out what we're doing wrong exactly-- it's always something different. This week it was ordering glasses of water. Once it was not ordering enough food. Another time it was ordering too wide a variety of food-- like they only wanted to cook chicken, not chicken and beef. Basically, whatever we are doing is wrong. The kids and I have our homeschool routine down now, and I think we're doing okay. Our days are longer than I expected they would be; maybe I'm doing it wrong. But learning seems to be happening, and with minimal complaining. I'll take it. Josh has been kindly taking the kids out to breakfast or on some sort of errand on Saturdays to give me a bit of time in which I can hear the sweet, sweet sound of silence. He's my favorite husband. I will leave off with some pictures from our vacation in early September. 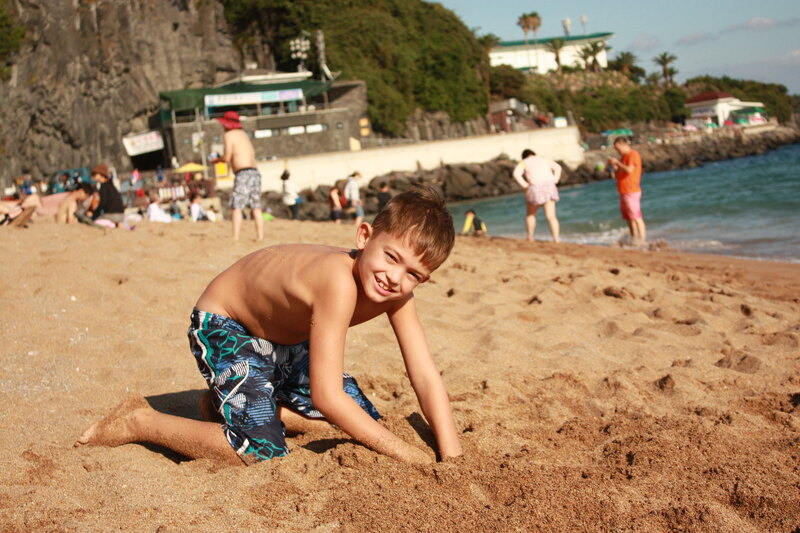 We spent a few nights in Seoul and then a few more on Jeju Island, which was lovely. I lied. The photo site is down, so the photos will have to wait. I must get to sleep-- tomorrow is Fun Friday, after all.